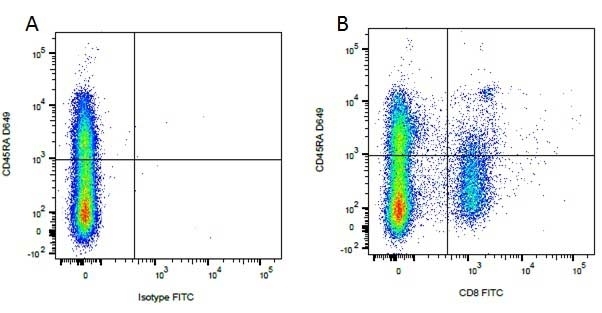 Figure A. RPE conjugated Mouse anti Dog CD8 (MCA1039PE) and purified Mouse IgG1 isotype control (MCA928) detected with Goat anti Mouse IgG (STAR70). 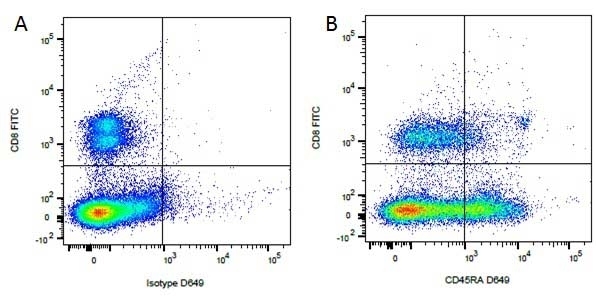 Figure B. RPE conjugated Mouse anti Dog CD8 (MCA1039PE) and purified Mouse anti Dog CD45RA (MCA2036S) detected with Goat anti Mouse IgG1 FITC (STAR70). All experiments performed on red cell lysed canine blood gated on lymphoid cells in the presence of 10% dog serum. Data acquired on the ZE5™ Cell Analyzer. Caniatti, M. et al. (1996) Canine lymphoma: immunocytochemical analysis of fine-needle aspiration biopsy. Vet Pathol. 33 (2): 204-12. Bauer, T.R. Jr et al. (2006) Correction of the disease phenotype in canine leukocyte adhesion deficiency using ex vivo hematopoietic stem cell gene therapy. Ting-De Ravin SS et al. (2006) Correction of canine X-linked severe combined immunodeficiency by in vivo retroviral gene therapy. Bauer, T.R. Jr et al. (2013) Long-term follow-up of foamy viral vector-mediated gene therapy for canine leukocyte adhesion deficiency. Mol Ther. 21 (5): 964-72. Rütgen BC et al. 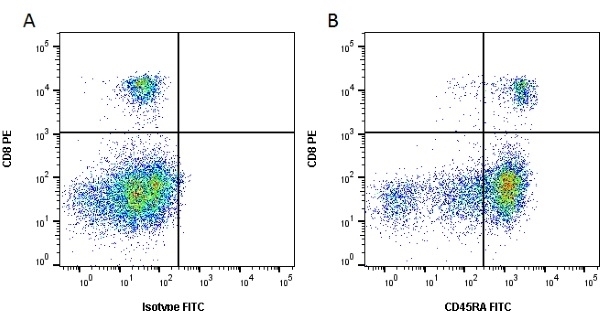 (2012) Authentication of primordial characteristics of the CLBL-1 cell line prove the integrity of a canine B-cell lymphoma in a murine in vivo model. PLoS One. 7 (6): e40078. Hartley, A.N. & Tarleton, R.L. (2015) Chemokine receptor 7 (CCR7)-expression and IFNγ production define vaccine-specific canine T-cell subsets. Vet Immunol Immunopathol. 164 (3-4): 127-36.